hi sara can you please make some instructional videos of some coll, but not to difficult origami tesselations? like that star puff thing i really enjoyed it! Where does one buy the glassine paper for these projects. Additionally, when I see your videos of other projects, you use different paper than what I am able to get. Could you please include the type of paper you use as well as where to purchase it? For example, for the kalidascope video, I didn't know where to get paper that size. I'd like to try what appears to be that type of shiney origami paper, but have no idea where it is sold. It is a hard question to answer, because I buy most of my paper offline, and the world is a large place. When I stroll through cities, I usually just go into any shops that seem to be selling paper. Like this I have found some nice papers. I also have some places I visit "regularly", because their stock is great. I've found that you can find glassine/pergamyn in most crafts stores, as well as in paper stores. The paper I used in the video for the kaleidoscopic twister is called Kraft paper. It's cheap wrapping paper, but quite good to fold with. You may be able to find it at IKEA, at least that's what someone from the US told me last week. It's sold in many different stores in Germany. If I remember correctly, you showed this book in one of your instructional videos, so I'm only assuming that you own it. 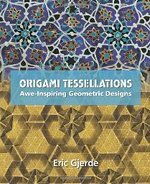 I was wondering if the book includes step-by-step instructions on how to fold all sorts of different tessellations, or are they just crease patterns?